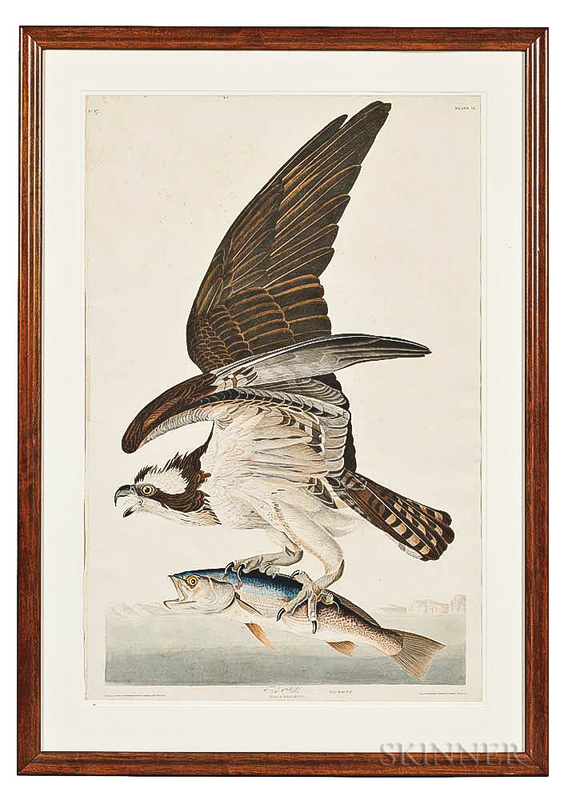 Guide to Collecting John James Audubon | The Value of Audubon Prints | Skinner Inc.
There’s a good reason that the book commands such high prices. Audubon created a genre of illustration that didn’t exist before. He depicted his birds life-size, exhibiting normal behaviors in their natural habitats. His abilities as an artist and high scientific standards are perfectly captured in his illustrations, and people of all ages and backgrounds are drawn to these lifelike images. Thankfully, for those of us who don’t have an extra $12 million lying around, individual prints from inside the book are often available at auction. In each Skinner Fine Books & Manuscripts Auctions, we offer large Havell and Bien Audubon plates, 19th century octavo-format sets of The Birds, individual octavo plates, and quadruped plates in octavo and folio formats. We also sold a complete folio edition of Audubon’s Quadrupeds. Knowing the edition is critical. Prints from the first edition were published by Havell and should measure approximately 30 x 40 inches. They were printed on watermarked wove paper by copperplate engraving and are hand-colored. These prints came out in the 1820s-1830s. Bien, a publisher in New York, printed a selection of plates by chromolithograph in the 1860s. These are nearly the same size but have a different paper and imprint. The octavo plates, by comparison only measure about 10 x 6 inches. Prints should never be mounted onto board, as acid can leach into the paper and affect the color. Exposure to direct sunlight fades the colors and can brown the paper. Folds, tears, or worn corners also affect the value of a print. Remember, prints are multiples – most collectors want to find and purchase the copy in the most pristine condition possible. These plates are nearly 200 years old, and much can happen to compromise condition. Even so, some examples are still in excellent shape. 3. What’s your favorite animal? 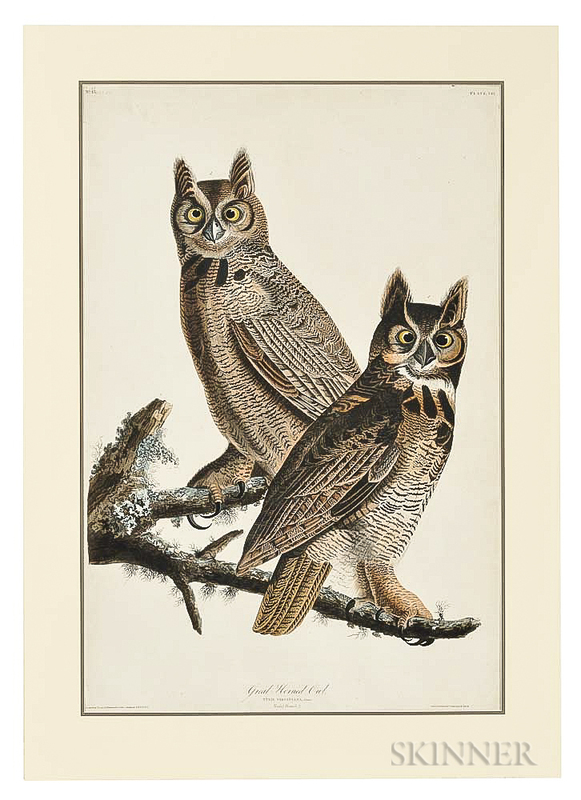 The subject matter of an Audubon print also helps determine the value. Larger birds tend to bring higher prices than the smaller songbirds. Great Blue Heron, American Flamingo, and Wild Turkey are three of the most valuable prints of The Birds of America. However, some of the smaller birds can also bring high prices at auction, including the Carolina Parrot, Robin, Mockingbird, and Ruff-Necked Hummingbird. The charm of the composition also affects value and the attitude of the animals. 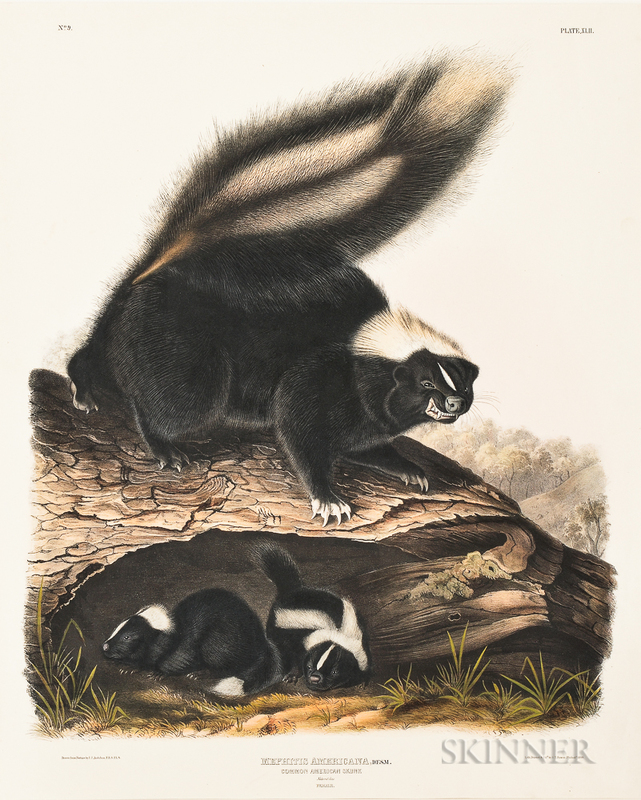 There’s something about the look of Audubon’s quadrupeds, the mother skunk defending her cubs looks defiant, and the presence of the Audubon raccoon is arresting and familiar to anyone who has interrupted a midnight garbage raid. If you have any Audubon prints that you would like assessed, please send an email with photographs, measurements, and a description and we will be happy to help you in any way we can. Collectors should set up lot alerts on the My Skinner section of the website. You wouldn’t want to miss out on the next great thing! Editor’s Note: This post was originally published in November 2013 and has been completely revamped and updated for accuracy and comprehensiveness. This entry was posted in Blog and tagged american flamingo, audubon, audubon birds, audubon prints, collecting Audubon, collecting guide, expensive books, fine books auction, hermit thrush, John James Audubon, natural history, natural history illustration, natural history prints, stanley hawks, The Birds of America, value of Audubon prints, wild turkey by Devon Eastland. Bookmark the permalink. Director of Fine Books & Manuscripts at Skinner, Inc.
Hi, I have an original Havell elephant folio paper…snowy egret. Is it still holding its value? It was upwards of $100,000 when I checked a few years ago. Gail, Thank you for your comment. I’ll be in touch over email. I believe I have a compete 4 volume set of havell Audubon birds of America. I am trying to estimate a value can you help me. there are watermarks with havell on some of the prints. what is given there is no other markings. They are on heavy cream colored stock paper in original envelope. These sound like modern reprints, and are likely not of high value. Hi looking for a little help i picked up two large prints at goodwill. one is no.37 Gordonia Pubesceus on the bottom it says engraved. printed. & coloured. by R. Havell.1833. Rosebreasted Grosbeck. 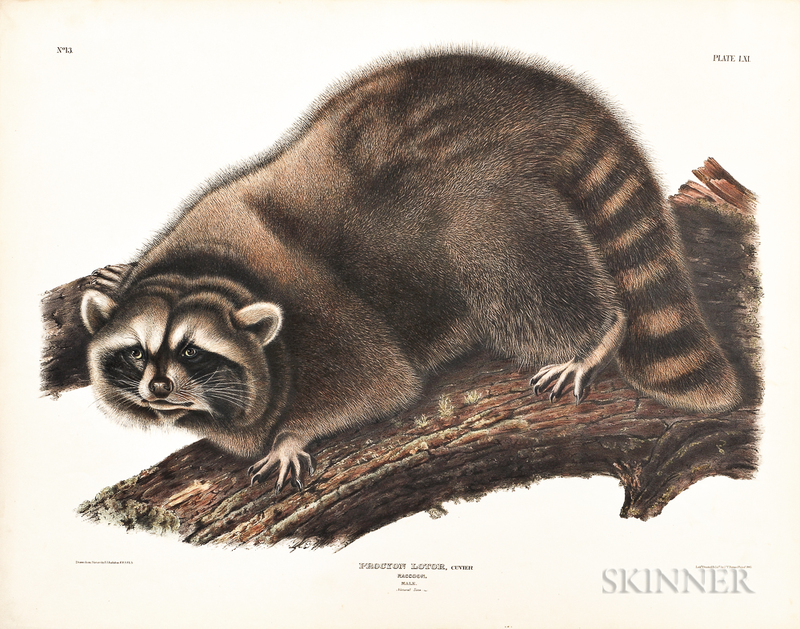 they both say Drawn from nature by J.J. Audubon. any help!!! are they worth anything? Thanks for your time!! Hi, I own a first edition set of the three volumes of Quadrapeds of North America octavo edition. 1849, 1851, 1854. They are fully bound and are in very good + condition with no issues to the plates on torn pages! etc. Melynda, Thank you for your comment. Devon Gray will be in touch over email to discuss your Havelli. I have several Audubon prints in my possession. If possible, can you tell me what the value is of these prints. an antebellum plantation mansion a few miles outside of New orleans in an estate purchase by the New Orleans Antiques Shop called The Treasure Trove or something close to that in 1966 or 67 while my husband and I were in the shop and we reserved the right to purchase at that time. The piece had been in the possession of the family who had resided in the home for generations, and this was the first time out of the home as the last of the family had just passed away. Do you have any idea of the current range of value for such a piece? I have 2 Audubon framed prints of Birds Of American “Turtle Dove” and Meadowlark”. Can you tell me what the value of these prints are. They are life size. Thank you. I have a Elephant sized print Wild Turkey, plate 1, print 1 and have no idea of value for insurance purpose. Can you give me an idea? Hi there, I am in Upstate, NY. I have 4 Audubon prints. The writing is correct on all of them (according to what is suppose to be on original prints), and I have looked in to a 17x loupe, and I do not see dots. I do see where the color has gone outside of the lines in areas though. They are all Art Gallery framed. So, I removed the paper and the cardboard backing to get to the print. The birds are life size. Each is Havell Senior and Havell Junior are on a couple, and one has Lizars name. The print is on a very thick stock card paper, not rollable. It has an indent around it. I see no water mark,… and then I realized that the size is not quite 20.5 long and not quite 13.5 wide. I think it has been trimmed. I am wondering if you believe that there remains monetary value. Thank You. I am interested in possible selling these and the other 3. I have a Bob Havelli plate ccccxl that was framed by Franklin Picture Company. Go from here to decide if I would like to sell or keep it as an investment for my grandchildren. Hi Delores, Skinner’s Appraisal Department would be more than happy to assist you in finding out more about your print, please submit photos and an auction evaluation form via our website: https://www.skinnerinc.com/selling/auction-evaluation-form/ or contact the Appraisal Department directly at 508-970-3299 or appraisals@skinnerinc.com. Thank you! I purchased a 1987-88 Introductory Edition 1,000 prints– Complete Folio includes – Deluxe Casing and illustrated text plus 5 original graphics (based on Audubon’s / Havell’s original works and engravings. Any thoughts? I appreciate any information you could offer. Hi Farrah, Skinner’s Appraisal Department would be more than happy to assist you in finding out more about your prints. Please submit photos and an auction evaluation form via our website: https://www.skinnerinc.com/selling/auction-evaluation-form/ or contact the Appraisal Department directly at 508-970-3299 or appraisals@skinnerinc.com. Thank you! I have a book signed by J.J. Audubon with 435 plates in it of birds from original drawings. The book and binding is in good condition. Is there any value to this? Thank you any information you could give. Skinner’s Appraisal Department would be more than happy to assist you in finding out more about your book. Please submit photos and an auction evaluation form via our website: https://www.skinnerinc.com/selling/auction-evaluation-form/ or contact the Appraisal Department directly at 508-970-3299 or appraisals@skinnerinc.com. Thank you! I just recently bought the 1946, fifth printing of the book, “Birds of America” at a yard sale. I am wondering as to its true value. Would you be able to tell me? Hello, Skinner’s Appraisal Department would be more than happy to assist you in finding out more about your book. Please submit photos and an auction evaluation form via our website: https://www.skinnerinc.com/selling/auction-evaluation-form/ or contact the Appraisal Department directly at 508-970-3299 or appraisals@skinnerinc.com. Thank you! I have a number of large Audubon prints. Most are more than 20 inches wide by 30 inches tall. For example, I have Carolina Parrots, Blue Jay, Wood Duck, Flamingo and others. I purchased the prints in early 1980s at the Smithsonian or at the National Gallery of Art in DC, when there was a big show of Auudubon prints. The pieces are beautifully framed, making these prints very powerful. What is an appropriate value for these pieces. Hello David, Skinner’s Appraisal Department would be more than happy to assist you in finding out more about the value of your Audubon prints. Please submit photos and an auction evaluation form via our website: https://www.skinnerinc.com/selling/auction-evaluation-form/ or contact the Appraisal Department directly at 508-970-3299 or appraisals@skinnerinc.com. Thank you! How much do you think that unicorn in the window would fetch at Auction? I am collecting items for a tag sale for my local library, and was given a set of 15 prints described on their original envelope as “extra set of illustrations to accompany your copy of Audubon’s America”. (Houghton Mifflin Company, Boston) Since these prints have no water mark, I’m assuming they are worth a lot less than the prints themselves would be. I’m raising money for my library, not for personal profit, and would appreciate any guidance you might be able to give me about what to do with these. Hi, I have an 1870 8-volume edition of ‘Birds of America’, complete with all 500 plates, bound in leather spine and boards. As I am interested in selling it I would appreciate an estimate of how much it would sell for. Can also send photos. Thanks. Did you ever sell your copy of Birds of America. It is mounted on a board. It has a price marked on the board of $350.00. Can you tell me it’s possible value? Hello Lisa, Skinner’s Appraisal Department would be more than happy to assist you in finding out more about the value of your Audubon prints. Please submit photos and an auction evaluation form via our website: https://www.skinnerinc.com/selling/auction-evaluation-form/ or contact the Appraisal Department directly at 508-970-3299 or appraisals@skinnerinc.com. Thank you! I have the following prints, showing various birds from the Audubon collection. I believe the prints were taken form a large-format Audubon Birds book, and framed. I am attaching photos. They are not highly professional, sorry. He prints themselves are in good condition. They are not glued to any backing material. He frames are gold-painted wood. Please let me know if you’d be interested in valuing and/or purchasing these prints? Please let me know where I can uplod the photos. Thanks. I have a framed print 24×18 of Cat Bird by John James Audubon. I would like to know the value. Have you ever heard of a book of Audubon prints which had a large number of prints each layered in between with onion paper or similar? Many years ago I bought about 30 Audubon prints at a share party. These are the Abbeville/Havell edition. They have been sealed up and protected for years. Would your store or anyone you know be interested in buying them all? I have the list of prints that I can provide if needed. Thank you and I hope to hear from you soon. I have 31 prints of various plate numbers that are in excellent condition and never been framed. On the bottom they show “Reproduced from the collection of the Milwaukee Public Library For the Northwestern Mutual Life Insurance Company”. I believe they are 40-50 years old. I am toying with donating them to a state Audubon society for their annual silent auction. But before I do I would like to know if they have value. I have twins boys graduating high school next year so if they have value that would help. My guess is that they don’t have much value and would probably be a more useful at the fund raiser. Please help me confirm. Hello Lou, We can certainly evaluate your set of prints, please contact the Skinner Appraisal Department – they would be more than happy to help you find more information about an appraisal/evaluation. You can contact the Appraisal Department by phone at 508-970-3299 or email evaluations@skinnerinc.com. If you can provide photos – here is the link to the appraisals form on our website: https://www.skinnerinc.com/selling/auction-evaluation-form/ Thank you!